This drug is not approved for use in children younger than 4 years due to increased risk of side effects (such as unusual fast breathing, worsening asthma). Ask your doctor or pharmacist for details. Read the Patient Information Leaflet provided by your pharmacist before you start using this medication and each time you get a refill. Follow the illustrated directions for the proper use of this medication and proper cleaning of the mouthpiece. If you have any questions, ask your doctor or pharmacist. Shake the canister well before using. Follow the instructions for test sprays in the air if you are using a canister for the first time or if you have not used it for 3 days or more. A fine mist is a sign that the inhaler is working properly. Avoid spraying the medication in your eyes. Inhale this medication by mouth as directed by your doctor, usually every 4 to 6 hours as needed. If two inhalations are prescribed, wait at least 1 minute between them. The dosage is based on your medical condition and response to treatment. Do not increase your dose or use this drug more often than prescribed without your doctor's approval. Using too much of this medication will increase your risk of serious (possibly fatal) side effects. Using a spacer device with the inhaler may help you use this medication properly. Ask your doctor or pharmacist for more information. If a child is using this medication, a parent or other responsible adult may need to help the child use the inhaler properly. Always have this quick-relief inhaler with you. Keep track of the number of inhalations you use, and discard the inhaler after you have used the labeled number of inhalations on the product package. Also count test sprays used to prime the inhaler. Do not float the metal canister in water to test if any more drug is left in the canister. What conditions does Levalbuterol Tartrate HFA Aerosol With Adapter treat? Nervousness, dizziness, shaking (tremor), trouble sleeping, headache, nausea, dry mouth, cough, sore throat, or runny nose may occur. If any of these effects persist or worsen, tell your doctor or pharmacist promptly. Get medical help right away if you have any very serious side effects, including: chest pain, irregular heartbeat, rapid breathing, confusion. List Levalbuterol Tartrate HFA Aerosol With Adapter side effects by likelihood and severity. Before using this medication, tell your doctor or pharmacist your medical history, especially of: heart problems (such as irregular heartbeat, angina, previous heart attack), high blood pressure, kidney disease, seizure. What should I know regarding pregnancy, nursing and administering Levalbuterol Tartrate HFA Aerosol With Adapter to children or the elderly? Does Levalbuterol Tartrate HFA Aerosol With Adapter interact with other medications? Store at room temperature away from direct sunlight. It is best to store the inhaler with the mouthpiece down. Avoid freezing. Do not puncture the canister or expose it to high heat or open flame. Keep all medications away from children and pets. 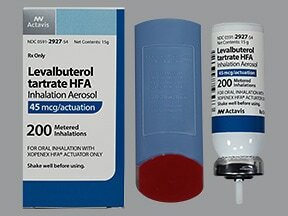 Are you taking Levalbuterol Tartrate HFA Aerosol With Adapter? Are you considering switching to Levalbuterol Tartrate HFA Aerosol With Adapter? How long have you been taking Levalbuterol Tartrate HFA Aerosol With Adapter?